Me, I think the guy's just potty. Plant your thoughts in the comments and we'll share the best on Saturday. "Can you ear me now?" Sometimes, (just sometimes) I crack myself up! BTW... Good one, Quirks! Wish I'd thought of that! Im laughing too much at Moogs comment to come up with anything else to add! Marcel was always ahead of the trends. 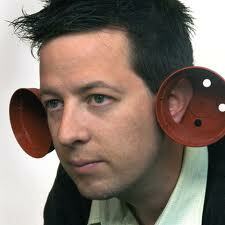 He had vertical ear cups before anyone had even heard of them. Scientists have discovered a device that filters in only TV. This device can be programmed universally into your remote control and is all a man who loves sports needs besides an ice cold brew to truly enjoy the weekends. "You see, it's very simple. When you wear these specially designed hearing cups, you tune into the frequency emitted by the tiny, red ants, and you will hear the secrets of the universe revealed. I am currently annotating all that I have learned from hours and hours of listening to their wise leader, Antera. Coincidentally, she told me that all of the songs of Johnny Cash have hidden meanings." The young Howard Cosell didn't foresee the effects his ear trumpets would have later in life. LOL @ Quirks and Mooooog! What? WHAT??? You have to go potty? Speak up!! I knew Moooooooooooooog had it wrapped up. Good going Moogster.